This 5-column, 3/4-page ad ran on July 21, 1968, in the Kingsport Times-News. I found it when I was going through an old scrapbook. Look! Not a syndicated show in sight; although, the stations did run some NBC and religious programming on the weekends. I always liked the NBC logo. The microphone is a stylized RCA 44-BX (bi-directional). The WKPT-AM studios used these, since the installation of the equipment after the fire* was supervised by NBC. *The WKPT studios burned on September 7, 1948, according to the Kingsport Times-News (I misread that date. It was 1946. When I enlarged the page, I saw that it was a “6”, not an “8”, but it was a kind of skeevy 6, at that). The new studio, with all new equipment, opened in ’48. This entry was posted in Kingsport TN ephemera and tagged Bill Trailer, Bob King, Bob Lawrence, Country Giant, Glenn Sounders, Housewife Serenade, John Dotson, John Williams, Martin Karant, Mike Jackson, NBC, Pops in the Afternoon, RCA 44-BX microphone, Sounds of Summer '68, The Gloom Chaser, The Rusty Cury Show, The Watchman, Uncle Charlie Deming, WKPT-AM, WKPT-FM on October 11, 2017 by Bob Lawrence. This was a tough one to scan and clean up. It’s 19.75″ by 9.75″ and, over the years, it’s gone from white to a light ecru, but not a consistent shade. Three people are on the phone in their photographs. I don’t know what to say to that. I didn’t actually participate in this one. In a later year, I actually got tossed off the telethon because I was singing so badly and loudly. Never did fit in, never will. 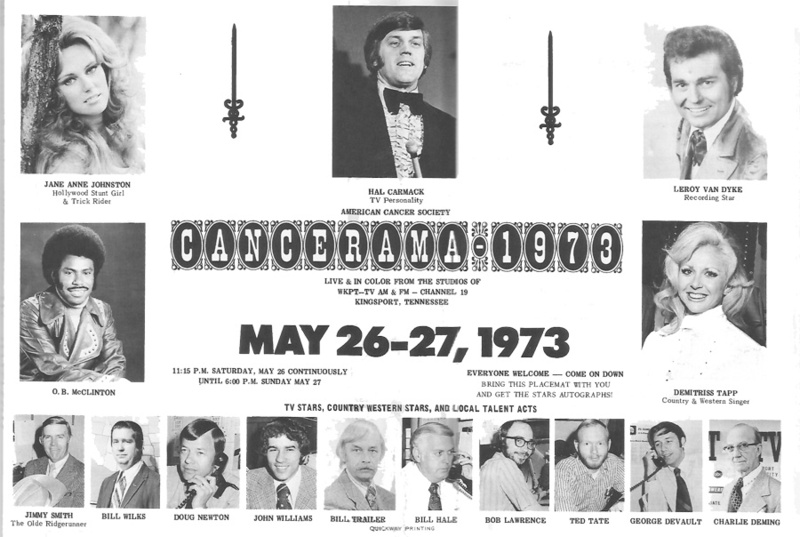 This entry was posted in Kingsport TN ephemera and tagged Bill Hale, Bill Trailer, Bill Wilks, Bob Lawrence, Cancerama 1973, Charlie Deming, Demitriss Tapp, Doug Newton, George DeVault, Hal Carmack, Jane Anne Johnston, Jimmy Smith, John Williams, Leroy van Dyke, O.B. McClinton, Ted Tate, The Old Ridgerunner, wkpt-tv on July 25, 2015 by Bob Lawrence.